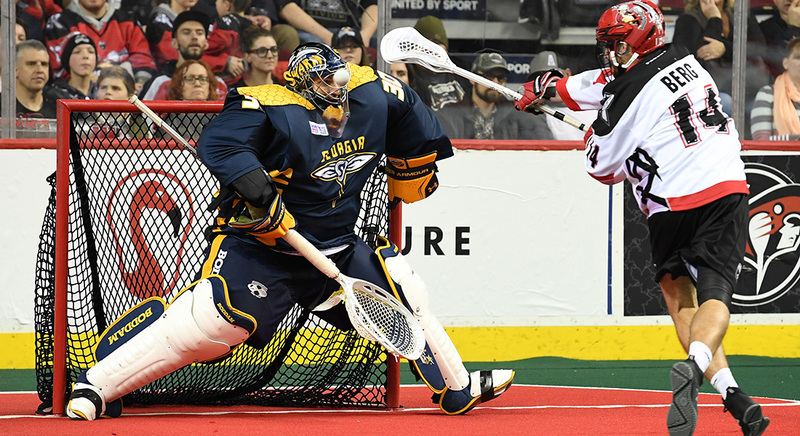 The Roughnecks had a 9-6 lead over the visiting Georgia Swarm on Saturday, but they weren’t able to hold on for their second win of the season. Led by Shayne Jackson, who finished the game with four goals and six assists, the Swarm reeled off six straight goals in the third quarter on their way to a 15-12 win over the Roughnecks in front of 11,843 fans at the Scotiabank Saddledome. Wesley Berg led the way for the Roughnecks (1-4) with four goals and two assists, while Dane Dobbie scored twice and set up four others. Holden Cattoni and Riley Loewen two goals and two assists each for the Riggers, while Curtis Dickson and Tyson Bell also scored. In a relief appearance of starting goalie Frank Scigliano, Christian Del Bianco let in three goals on 16 shots and wound up taking the loss. Scigliano finished with 24 saves before giving way to his counterpart. Randy Staats had four goals and an assist for the Swarm (2-3), while Miles Thompson scored twice. Kiel Matisz, Johnny Powless, Jordan MacIntosh, Jesse King and Alex Crepinsek also scored, while former Roughnecks goalie Mike Poulin played well in net for Georgia as he stopped 45 of 57 shots he faced. Staats opened the scoring 61 seconds into the game for the Swarm, before Dobbie responded with a power-play goal for the Riggers at 2:45. After Jackson scored on a breakaway to put the visitors up 2-1 at 6:40, Loewen answered right back for the ’Necks 22 seconds later. Georgia then took a 4-2 lead before Berg drove to the net and scored a quick-stick goal to pull the Riggers within one before the end of the first quarter. Calgary controlled the second quarter as Berg and Cattoni both scored twice, while Dickson also found the back of the net to give the home side an 8-6 advantage going at halftime. Things were looking good for the Riggers as Bell scored a short-handed goal at 3:21 of the third quarter, but the Swarm buzzed back with six straight tallies to take a 12-9 lead. Undeterred, the Riggers kept pressing and were rewarded with goals by Berg and Dobbie to pull Calgary within a goal heading into the final frame. Matisz and Jackson scored insurance markers for the Swarm in the fourth quarter before Loewen scored his notched his second of the night with 57.1 seconds left on the clock to give the ’Necks some hope. Crepinsek then dashed those hopes when he scored into an empty net. After a bye week, the Roughnecks will return to action on Saturday, Jan. 27 (7 p.m.) when they host the Saskatchewan Rush at the Saddledome.